Tour of Crimea being stolen: The eve of Russia’s invasion of Ukraine. A first-person tour of the Crimean peninsula—as it’s being stolen. Russian forces have taken several Ukrainian military installations in Crimea without firing any shots. On the platform in Moscow, two burly men smoke cigarettes beside the idling train. When they aren’t taking pulls, the frost from their breath leaves its own haze. The carriage is painted deep blue with a thin yellow stripe running horizontally along the side—the colors of the Ukrainian flag. The men, both Russians, face away. “I hear they’ve raised the Russian flag in Donetsk?” one says. It’s late February—Ukraine’s fugitive President Viktor Yanukovych is on the run and I’m heading to Ukraine to see the aftermath of the “Euromaidan.” Months of protests on Independence Square in Kiev—known colloquially as the “Maidan”—led to the overthrow of Ukraine’s government. The protests began in response to Yanukovych’s decision not to sign an association agreement with the EU. Now, as Russia has pushed back, moving to annex Crimea, the crisis has escalated into the most ominous clash between Russia and the West since the end of the Cold War. My sleeper cabin, or kupe, is empty, like most of the countryside we’ll soon roll through. Train travel in this part of the world demands an appreciation of the desolate. The border between Russia and Ukraine passes imperceptibly, a slow blur of bare birches and knotted telephone wires. We stop once in Dolbino, on the Russian side, where a police officer in black checks passports; we stop again in Kozacha Lopan on the other side, before arriving in Kharkiv, onetime capital of the Ukrainian Soviet Socialist Republic. The next day, I meet a colleague, and we set off for Crimea on the night train. We pay the conductor a 10 hryvnia—about $1—bribe to let us smoke as we ride. The passengers, the conductor—everyone, it seems—say the Russians are coming. Deep potholes dot the streets of Simferopol, forcing drivers to swerve between lanes, like a traffic double helix. The city center is lined with crumbling pre-revolutionary facades, only two or three stories tall. It feels almost too calm. I wander down Karl Marx Street, one of Simferopol’s main drags, seeking the Crimean parliament building, which gun-wielding masked men took over the night before. The parliament, gray and imposing, occupies an entire block. Across the street to one side stand a gold-domed Orthodox church and a retired tank, a memorial to Soviet World War II veterans. On the other side is a plastic playground—monkey bars and slides—but there are no children playing. Instead, men like Vitaly Zakharov, 72, wave Russian and Soviet-era flags, and pine for the past. People here seem to believe that untangling their DNA from Ukraine will straighten out the traffic on their streets—that making Crimea Russian again will make their roads flatter, their pensions higher, their lives better. The road to Kerch, on Crimea’s easternmost tip, cuts through rolling hills. If you look past the half-built houses, it reminds you a bit of Napa Valley, with rows of bare grape vines, trellised and waiting for spring. You can see flashes of the coast through the gaps between the hillsides. We drive past old bus stops decorated with socialist realist mosaics. At the entrance to a region called “Leninsky,” an obelisk towers over empty fields. “Glory to Labor!” it reads. Yet no one, it seems, is working here—there is, quite simply, nothing to work on. Other than a pair of military trucks—forest green with no license plates—we have yet to see any signs of war on the eastern half of the peninsula. A massive anchor marks the beginning of Kerch proper. This was once an ancient Greek colony, a crossroads between the Central Asian steppe and the European markets. (In 2001, Vladimir Putin went on a staged dive in the Kerch Strait and miraculously returned with fragments from two Greek urns.) Now, it’s a monotonous, boxy post-Soviet port city, replete with a Lenin monument in the town square. Hop on a ferry and you can be in Russia in less than an hour. Under the monument, a young man with a crew cut and a black Adidas track suit (in Russia, they call this style “Gopnik”—think American “white trash”) sells tricycle rides to kids. They whirl gleefully around a flagpole that now flies the Russian flag. Someone put a sticker on the flagpole that reads, “Stop Maidan!” in reference to the Kiev protest movement that overthrew Yanukovych’s government. Some would argue the opposite: that without Ukraine, there wouldn’t be a Russia. Or, at least, there wouldn’t have been a Russian empire. I am in Yalta, meeting with professors from the history department at the Crimean University for the Humanities. The university stands on a side street off a road lined with palm trees. The desktop background on the department computer is a photoshopped Ukrainian Internet meme of Putin as an obese rat, emerging from a blood-red Kremlin and crawling into Ukraine. Marina Budzar, one of the department’s docents, worries that the meme may be all too accurate. “Crimea has always been a necessary factor for the Russian empire’s development,” she says. She has short, dark hair—wavy and cut top-heavy—and it seems to shudder as she speaks. She, like many other Crimeans, is losing sleep these days. Her eyes look weary. She fears isolation. She fears the day-to-day challenges that lie on the other side of the geopolitics: If Crimea becomes Russian, what will happen to her university, to her job? Where will Crimea get its food, its water, its electricity? Most of all, she and her countrymen fear war. “Practically every Russian czar fought a war in Crimea,” her colleague chimes in. The question about war—namely, about whether there will be war throughout Ukraine—is a question about empire and about how deeply Putin longs for the past. 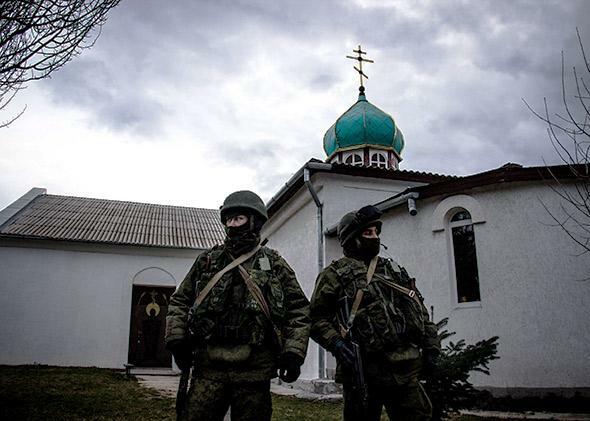 Unmarked soldiers, widely understood to be Russian, wait outside a church on a Ukrainian military base in Perevalnoye. 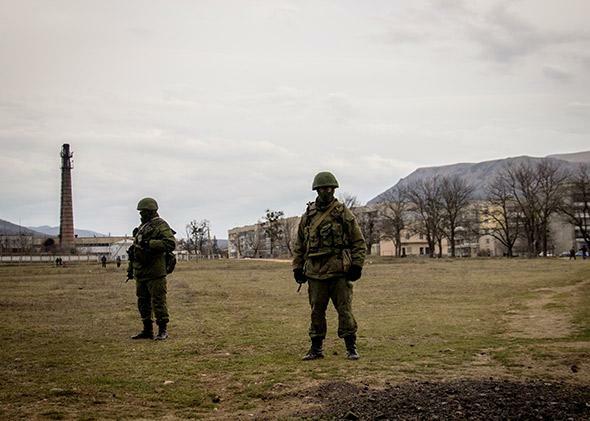 At Perevalnoye, a windswept Ukrainian base south of Simferopol, the little green men surround the walls. Here, the scene has settled into a strange equilibrium: The soldiers flaunt their plumage to a crowd of journalists, toting machine guns and looking sinister. The journalists see how close their lenses can get to the soldiers. It is an obscene media mating ritual. Then, once too many pictures have been snapped or too many questions have been asked (not that the soldiers answer any of them), a second wave of men step forward. They are a motley assortment of local thugs and ex-Berkut riot police. They ask to take pictures with the journalists (for the memories, they joke) and scream obscenities about the evils of the Western press. Crimea is not a real war, but it is a media war. Perhaps this is fitting, as war photography was effectively born during the Crimean War in the 1850s. At that time, Russia invaded under the auspices of protecting local Orthodox Christians. But the czars also saw southern expansion as essential to building their empire—its borders had reached a zenith on the eve of the action. The Russians fought, and lost, against a coalition of the French, British, and Ottoman empires, and the Kingdom of Sardinia. It took more than two bloody years for the Russian military to concede defeat, and the loss helped lead Czar Alexander II, who ascended to throne as the war droned on, to embark on Russia’s most expansive liberalizing reforms since Peter the Great. These steps, most notably the emancipation of Russian serfs in 1861, arguably opened the way for the Russian Revolution. Now, the Russians are in Crimea again, ostensibly to protect their ethnic brethren. This time, though, there is no coalition, no country, no empire, prepared to stop them. While the West wails on about potential sanctions, Crimea has been seized, and the only shots fired have been at the air. By midweek, the upcoming Sunday vote about whether to split from Ukraine and join Russia feels like a formality. Since the current Crimean parliament fixed the date of the referendum, strangely slick billboards have popped up around Simferopol. They come in several versions, one reads “Together with Russia!” next to a large check box, above a red stripe that says “Referendum, March 16.” Another has a bouquet of white flowers in the background, and also says, “Together with Russia!” No one has seen a “Together with Ukraine” sign yet. Not all Crimeans, however, accept this fait accompli. A small pro-Ukraine protest has held out at the central park named after Ukraine’s national poet, Taras Shevchenko. The protesters pass out fliers—also red and white—that say, “What will happen to Crimea after entering Russia? Are you sure that Russia will invest its own resources in Crimea? … Think for yourselves! Do you think that Russia is really interested in Crimea’s development? … Do you want this?” Those gathered here worry about what joining Russia would really involve; they have no nostalgic illusions about the bright Soviet past. She holds a single white rose in her wrinkled hands. At the edge of the crowd, I find Emine Bagatyrly, 30, holding the corner of a big Ukrainian flag.